Or get the Motherpeace Deck by itself. Measurements: 3 inches; or 77 mm in diameter. Back of card: Yellow/orange. Round golden sun like wheel with eight small wheels "orbiting" around it. Book included: Yes, 127 pages, 4.4 x 7 inches, or 11.2 x 17.8 cm. Illustrated. 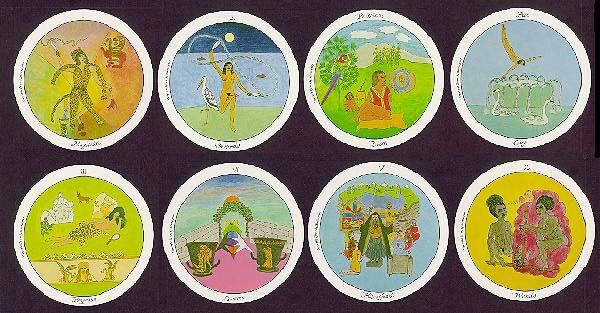 Comments: First published in 1981, this is perhaps the first round tarot deck (I want to say it is the first, but the late '60's were kind of wild) & one of the first feminist decks. Unlike later feminist decks, this shows men (though not a lot of them), particularly in the Sons cards, a compliment to the Daughters cards & both part of Court cards which also include Priestess & Shaman. Cards are much less militant than some of the later feminist round decks, though we noticed that the Empress is either eleven feet tall, or is up to something naughty!